Four days ago I announced a policy change at Ron’s View, promising shorter and less-thought-out posts so that I could return to old posting volumes. Four posts followed that evening, but nothing since. Maybe it’s time to work through my backlog of drafts and get some of them out, finished or not. For example, when we were on Nantucket a few weeks ago, I assembled some pieces about a book I had started reading, intending to write in more detail once finished. But that has yet to happen. Let me salvage something from those pieces. During our Nantucket stay, I read Lee Child’s new Jack Reacher thriller Never Go Back, to which I had devoted three posts (last one here). 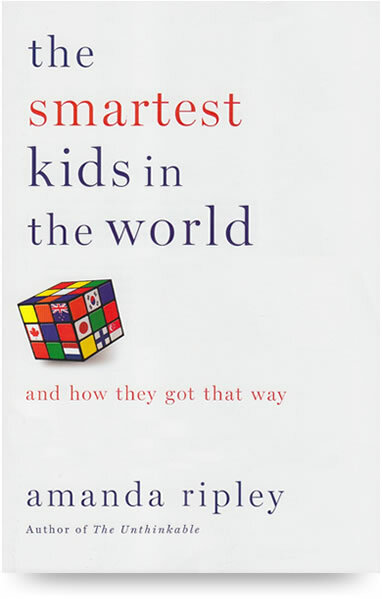 The day I finished it, I saw a reference to a book that had received a lot of attention when it came out a few weeks earlier, Amanda Ripley’s The Smartest Kids in the World: And How They Got That Way. I downloaded the free Kindle sample that night, read it, then downloaded the full book the next morning. Regarding the attention the book received, in the NYT alone there was both a Charles Blow column and a Sunday review by Annie Murphy Paul. But Ripley … has a more challenging, and more interesting, project in mind. Yes, she travels to Finland to observe the “Nordic robots” who achieve such remarkably high scores on international tests — and to South Korea and Poland, two other nations where students handily surpass Americans’ mediocre performance. In the best tradition of travel writing, however, she gets well beneath the glossy surfaces of these foreign cultures, and manages to make our own culture look newly strange. It’s the review’s conclusion that really got my attention. Ripley succeeds in making our own culture and our own choices seem alien — quite a feat for an institution as familiar and fiercely defended as high school. The question is whether the startling perspective provided by this masterly book can also generate the will to make changes. For all our griping about American education, Ripley notes, we’ve got the schools we want. Still, I forgot about the book until that day on Nantucket. It’s short. After downloading it, I read a ways into it while we sat by the ocean, read another chunk in the afternoon by the bay, then finished it the next day. In a handful of nations, virtually all children are learning to make complex arguments and solve problems they’ve never seen before. They are learning to think, in other words, and to thrive in the modern economy. What is it like to be a child in these new education superpowers? In a global quest to find answers for our own children, author and Time Magazine journalist Amanda Ripley follows three Americans embedded in these countries for one year. Kim, 15, raises $10,000 so she can move from Oklahoma to Finland; Eric, 18, exchanges a high-achieving Minnesota suburb for a booming city in South Korea; and Tom, 17, leaves a historic Pennsylvania village for a gritty city in Poland. Their stories, along with groundbreaking research into learning in other cultures, reveal a pattern of startling transformation: none of these countries had many “smart” kids a few decades ago. They had changed. Teaching had become more rigorous; parents had focused on things that mattered; and children had bought into the promise of education. By far the most enjoyable passages are those in which we follow the three American students in Finland, South Korea, and Poland. Back when I read the book and started this post, I anticipated elaborating on this. No point now. The students are mostly forgotten. I also anticipated quoting some passages about math education. Not that I claim any special expertise on this, despite years of teaching mathematics. I know a few things about math, maybe even a few things about teaching, but not much about how K-12 math education is best done. I have ideas, yes, but haven’t studied the research or the data, so I don’t presume that my ideas have any special merit. Nonetheless, there were some fascinating bits. In 2011, I took a tour of a Washington, D.C., private school that was hard to get into and cost about $30,000 a year. … strange things happened on this visit. When the head of the school talked, nothing she said made sense to me. There was a lot of jargon about the curriculum and vague promises of wondrous field trips and holistic projects. All the visiting parents nodded; I got the sense that no one wanted to say anything off key that might hurt a child’s admission chances. Then a parent with three children at the school took us for a tour. We saw gleaming floors, bright, colorful walls, beautiful, framed art projects, and other seductive tokens. Finally, one visiting father asked a good question. I was speechless. Imagine visiting a tony private hospital that only admitted healthy patients who could afford its services, and finding out the surgery practice was weak. What did it mean if the math program was weak at a school that made small children take I.Q. tests before they were even accepted. That particular parent wrote a check each year for about $90,000 to this school to cover the tuition for her three children. Wouldn’t she demand decent math classes in exchange? But no one said anything. Maybe all the parents were stunned as I was. Then the tour guide parent added one more thing. Suddenly, the parents perked up. I wandered out into the parking lot, mystified. Perhaps this explained why our most affluent kids scored eighteenth in math compared to affluent kids worldwide: Even wealthy American parents didn’t care about math as much as football. I would say more, but I have to go catch some highlights from tonight’s 49ers football game.